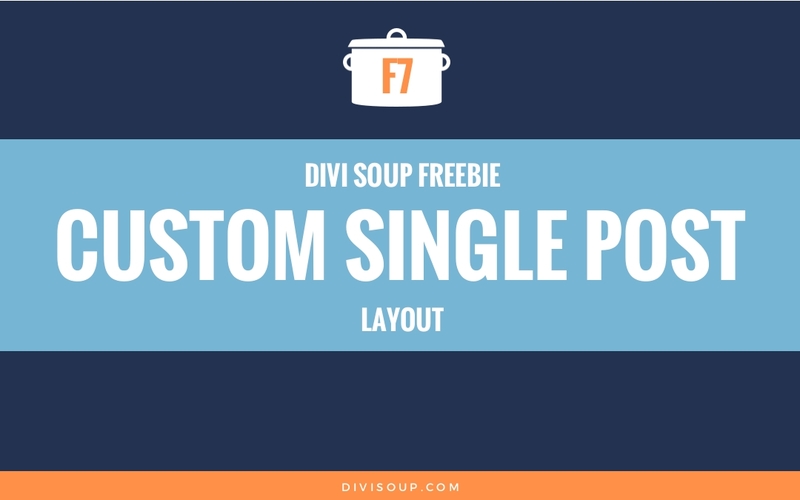 Custom Single Post Free Divi Layout. This free Divi resource consists of a single.php file to add to your child theme along with some additional code snippets. Together these add an author box, post navigation and related posts section to your single posts as well as styling for the sidebar. View the demo and download this free layout plus 24 other awesome free Divi resources by subscribing below. The removal of by and pipes are not working in divi post title module. Can you please update this code so that it will also work on divi post title module. Thank You. Hello, I did according to the tutorial, but the image was very large on the desktop and the mobile version was very upright. In fact it seems that it did not work on the mobile as it is not in the standard. Another problem I found is that as one of the post has youtube video, the screen is very large and at the same time cropped. I’m obviously missing something. Where is the basic post layout? Or do I download a divi post layout and use the css and php to change this? This is designed to work with posts in the Divi theme that DO NOT use the Divi Builder. Managed to get the post to load but it’s filling the whole screen – not centred like the demo. Also I’ve selected a featured image but this is left justified and the sidebar begins underneath this. Do I need to do something else to get this to look like the demo version? Sounds like you are still using the Divi Builder, which this layout isn’t designed to work with, or a child theme with conflicting CSS. I’ve tested this myself and it’s working fine. You can see that example here. Thanks your your help. Not using Divi Builder but think I had some stray css code. Now working fine thanks. I usually get there in the end – with help. Oh, never mind that last question. I found it. Now for another question — how can I completely omit the use of an author avatar? My client does not want to use Gravatar! Or have a useless gray image there. Thanks. I’ve got it installed per your instructions and was able to change the colors too. Maybe I’m missing something but how/where do I put the author avatar and short About text into the Author box? Thanks. I love the design, to my bad luck I follow all the steps, I have the latest version of Divi and the son theme. When I upload the single.php the articles return me error and they stop seeing, I’ve even tried a clean installation and nothing. Is there any requirement other than the tutorial? Thank you. If you are following all the steps in the tutorial there is no reason it wouldn’t work. You may need to check your child theme for a conflict. Thanks, I looked at the son theme. Finally it failed because you have to have the directive short_open_tag activated on the server. When activated it worked and the post is seen correctly. Hi, Michelle. Thank you for this, it works beautifully! There’s an error in the ‘Previous Post’ text link, which makes it point to the next post. I thought this was only on my installation, but it’s also in the demo. Could you share a fix, please? Working fine for me on the demo – this is a WordPress feature, so you may have a plugin conflict on your site. No, I believe you’ll find in the demo, when you click on the text, it takes you to the next post, not the previous one. Clicking on the button is fine, it’s the text beneath it that has the error. Ah, I see. That is a little bugger…we’ll take a look. If you download the layout again, you can find an updated single.php file to upload – this should fix it. Updates? No, it works as is unless there is some conflict on your site with a plugin, caching, or other code. I compared the code from both versions (the original and the updated) and they are exactly the same. Have you tried uploading the new file though? I found the bug in single.php and fixed it on my version. On line 146 the previous permalink variable is overwritten by the next permalink function. I changed it to use two separate variables. Thank you for confirming the bug, Tam. I’m not entirely sure how to go about fixing it, but I’ll have a stab at it. Thanks again! THANK YOU, Tam! I did what you said and it worked perfectly.